Old blind-tooled brown morocc, rebacked, preserving original spine, brass clasps and catches. 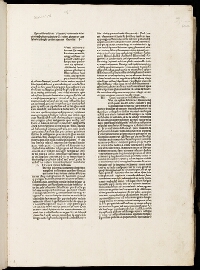 404 leaves, including preliminary and terminal blanks; spaces for initials, unrubricated throughout; some contemporary marginalia. 1. Herschel V. Jones. 2. Eric Sexton (bookplate), Christie's 1981, lot 166.